First the cover caught my eye, then the title; the clincher, was Keane is a first time novelist. 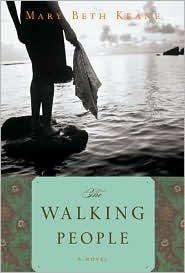 A beautifully old-fashioned novel, The Walking People is a debut of remarkable range and power. The story deals with the experience of Irish immigrants acclimating to America in the early 1960's. It looks at the total life experience of Michael and Greta Ward, who came to New York City, straight off the boat. At its core, this is a story of how people form a family, and the strength that it takes to come to a new country and build a life, the difficulty of leaving the old country and old ways behind. The Walking People is thoughtful and appealing; it's a solid, intelligent piece of work, and I highly recommend it.